Food Addiction: Could it Explain Why 70 Percent of America is Fat? New discoveries in science prove that industrial processed, sugar-, fat-, and salt-laden food—food that is made in plant, rather than grown on a plant, as Michael Pollan would say—is biologically addictive. Imagine a foot high pile of broccoli, or a giant bowl of apple slices. Do you know anyone who would binge broccoli or apples? On other hand, imagine a mountain of potato chips or a whole bag of cookies, or a pint of ice cream. Those are easy to imagining vanishing in an unconscious, reptilian brain eating frenzy. Broccoli is not addictive, but cookies, chips, or soda absolutely can become addictive drugs. Why is it so hard for obese people to lose weight despite the social stigma and health consequences such as high blood pressure, diabetes, heart disease, arthritis, and even cancer even though they have an intense desire to lose weight? It is not because they WANT to be fat. It is because certain types of food are addictive. Food made of sugar, fat, and salt can be addictive. Especially when combined in secret ways the food industry will not share or make public. We are biologically wired to crave these foods and eat as much of them as possible. We all know about cravings, but what does the science tell us about food and addiction, and what are the legal and policy implications if certain food is, in fact, addictive? Let’s examine the research and the similarities between high-sugar, energy-dense, fatty and salty processed and junk food and cocaine, heroin, and nicotine. We’ll start by reviewing the diagnostic criteria for substance dependence or addiction found in the bible of psychiatric diagnosis—the DSM-IV and look at how that relates to food addiction. Persistent desire or repeated unsuccessful attempts to quit—consider the repeated attempts at diet so many overweight people go through. Much time/activity is spent to obtain, use, or recover—those repeated attempts to lose weight take time. Important social, occupational, or recreational activities given up or reduced—I see this in many patients who are overweight or obese. Use continues despite knowledge of adverse consequences (e.g., failure to fulfill role obligation, use when physically hazardous)—anyone who is sick and fat wants to lose weight, but without help few are capable of making the dietary changes that would lead to this outcome. Tolerance (marked increase in amount; marked decrease in effect)—in other words you have to keep eating more and more just to feel “normal” or not experience withdrawal. Characteristic withdrawal symptoms; substance taken to relieve withdrawal—many people undergo a “healing crisis” that has many of the same symptoms as withdrawal when removing certain foods from their diet. Few of us are free from this addictive pattern. If you examine your own behavior and relationship to sugar, in particular, you will likely find that your behavior around sugar and the biological effects of overconsumption of sugar match up perfectly. Many of the criteria above are likely to apply to you. We blame the fat person. But how can we blame a two-year-old for being fat? How much choice do they have? There have been times when I consumed certain foods so often or in such large quantities that I spent time dealing with negative feelings from overeating instead of working, spending time with my family or friends, or engaging in other important activities or recreational activities I enjoy. I have had withdrawal symptoms when I cut down or stopped eating certain foods. (Please do NOT include withdrawal symptoms caused by cutting down on caffeinated beverages such as soda pop, coffee, tea, energy drinks, etc.) For example: Developing physical symptoms, feeling agitated, or feeling anxious. 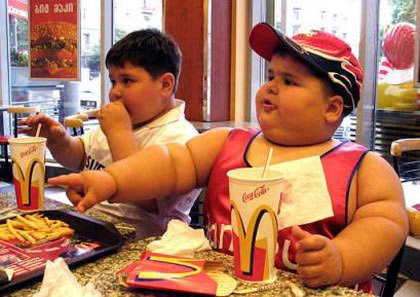 Based on these criteria and others many of us, including most obese children, are “addicted” to industrial food. Sugar stimulates the brain’s reward centers through the neurotransmitter dopamine exactly like other addictive drugs. People (and rats) develop a tolerance to sugar—they need more and more of the substance to satisfy themselves—just like they do for drugs of abuse like alcohol or heroin. Just like drugs, after an initial period of “enjoyment” of the food the user no longer consumes them to get high, but to feel normal. This problems with food addiction are compound by the fact that food manufacturers refuse to release any internal data on how they put ingredients together to maximize consumption of their food products despite requests from researchers. In his book, The End of Overeating, David Kessler, MD, the former head of the Food and Drug Administration, describes the science of how food is made into drugs by the creation of hyperpalatable foods the leads to neuro-chemical addiction. Stop and think about this for one minute. If you were to eat 500 more calories in a day, that would equal 182,500 calories a year. Let’s see … if you have to eat an extra 3500 calories to gain one pound, that’s a yearly weight gain of 52 pounds! If high-sugar, high-fat, calorie-rich, nutrient-poor, processed, fast, junk food is indeed, addictive, what does that mean? How should that influence our approach to obesity? What implications does it have for government policies and regulation? Are there legal implications? If we are allowing and even promoting addictive substances in our children’s diets, how should we handle that? I can assure you, Big Food isnt’ going to make any changes voluntarily. They would rather ignore this science. They have three mantras about food. The biggest sham in food industry strategy and government food policy is advocating and emphasizing individual choice and personal responsibility to solve our obesity and chronic disease epidemic. We are told if people just wouldn’t eat so much, exercised more, and took care of themselves, we would be fine. We don’t need to change our policies or environment. We don’t want the government telling us what to do. We want free choice. The reality is that many people live in food deserts where they can’t buy an apple or carrot, or live in communities that have no sidewalks or where it is unsafe to be out walking. We blame the fat person. But how can we blame a two-year-old for being fat? How much choice do they have? We live in toxic food environment, a nutritional wasteland. School lunchrooms and vending machines overflow with junk food and “sports drinks.” Most of us don’t even know what we’re eating. Fifty percent of meals are eaten outside the home and most home cooked meals are simply microwavable industrial food. Restaurants and chains provide no clear menu labeling. Did you know that a single order of Outback Steakhouse cheese fries is 2900 calories or a Starbucks venti mocha latte is 508 calories? Subsidize the production of fruits and vegetables. 80 percent of government subsidies presently go to soy and corn which are used to create much of the junk food we consume. We need to rethink subsidies and provide more for smaller farmers and a broader array of fruits and vegetables. Incentivize supermarkets to open in poor communities. Poverty and obesity go hand in hand. One reason is the food deserts we see around the nation. Poor people have a right to high-quality food too. We need to create ways to provide it to them. Change the school lunchroom. The national school lunch program in its present form is a travesty. Unless we want the next generation to be fatter and sicker than we are, we need better nutriton education and better food in our schools. For those with personal struggles with food addiction, remember it is not a moral failing or lack of willpower. Here are a five suggestions I offer my patients to help them break their food addictions. Eat a nutritious breakfast with some protein like eggs, protein shake or nut butters. Studies repeatedly show that eating a healthy breakfast helps people maintain weight loss. 2. Eliminate sugar and artificial sweeteners and your cravings will go away: Go cold turkey. Eliminate refined sugars, sodas, fruit juices, and artificial sweeteners from your diet, as these can trigger cravings. 3. Determine if hidden food allergies are triggering your cravings. We often crave the very foods that we have a hidden allergy to. For a simple allergy elimination program, consider trying The UltraSimple Diet, or The UltraSimple Diet Challenge Home Study Coaching Program. 4. Get 7-8 hours of sleep. Research shows that lack of sleep increases cravings. Optimize your vitamin D level: According to one study, when Vitamin D levels are low, the hormone that helps turn off your appetite doesn’t work and people feel hungry all the time, no matter how much they eat. Optimize omega 3s: Low levels of omega-3 fatty acids have also been associated with depression, Alzheimer’s disease and obesity. Consider taking natural supplements for cravings control. Glutamine, tyrosine, 5-HTP are amino acids that help reduce cravings. Stress reducing herbs such as Rhodiola can help. Chromium balances blood sugar and can help take the edge off cravings. Glucomannan fiber is very helpful to reduce the spikes in sugar and insulin that drive cravings and hunger. A growing body of evidence is focusing attention on the dangers posed by the myriad chemicals in our food. Although certainty around the precise impact of these chemicals is some way off, what we do know indicates a chemical cocktail of colourings, preservatives, and flavour enhancers, among other things, may be having a negative impact on our minds and bodies. The chocolate cake may well contain artificial colourings, along with the cocoa to give it that beautiful brown colour, and perhaps a preservative in the icing or cream, or even the cake itself. The vanilla latte will more than likely have a benzoate preservative in the syrup, as well as colourings, not to mention artificial flavourings. Public interest in artificial food additives was brought to the forefront in 2007 with the release of the so-called Southampton study. The results of this study showed the adverse effects of a mix of artificial colours and one preservative (all of which are permitted in Australia) for a group of children aged three to four and eight to nine years.